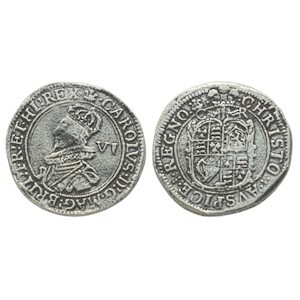 Obverse: Bust of Charles I in ruff with high crown with jewelled arches and with armour visible, left VI behind. Plume mintmark (Tower mint). Text around CAROLVS D G MAG BRIT FR ET HI REX. Reverse: Oval garnished shield with royal coat of arms, plume above with C R to either side. Text around CHRISTO AVSPICE REGNO (I reign under the auspices of Christ), seperated by groups of five pellets. History: Charles I attempted to be an absolute monarch and rule without Parliament. However, civil war broke out, the forces of the King lost, and Charles was beheaded.